When was the last time you tossed an old, unwanted piece of clothing into the garbage? If you’re like most Canadians, it wasn’t long ago. 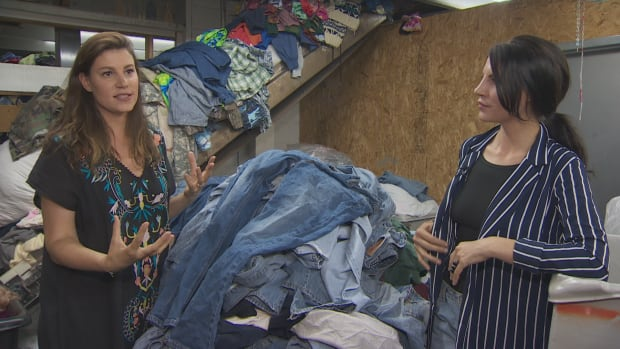 North Americans discard a mind-boggling amount of apparel — 12 billion kilograms of textiles every year, according to Value Village. And although we often donate to outlets such as the Salvation Army or Value Village, as much as 85 per cent of cast-offs end up in landfill sites. With stylish, inexpensive clothing readily available at fast fashion chains such as Zara, H&M and many other retailers, consumers can’t seem to get enough. By some estimates, we buy four times as much clothing as in 1980. “People are buying more all of the time, and that’s a really, really big problem,” says Kate Fletcher of the Centre for Sustainable Fashion in London. She points to social media as a factor that contributes to overconsumption. On the other side of the problem, though, is a growing community of fashion entrepreneurs who see an opportunity. Here are three Canadian startups that are taking aim at textile waste. Twin sisters Alexandra and Lindsay Lorusso of Toronto grew up in the trash business. Their father founded a waste management company, Wasteco, 40 years ago. With two young children and an interest in sustainability, Lindsay partnered with Alexandra to launch Nudnik, a line of children’s wear. T-shirts, sweatshirts and pants sewn from scraps of old fabric, then silk-screened with playful designs. “Through our waste management connections we’re able to know where to go to get this material direct from the source,” says Alexandra. By re-purposing other people’s castoffs, the women are upcycling, reusing old materials so the new product has a higher quality or value than the original. “We might have someone come to us and say, ‘We have a bunch of tents that we need to dispose of,’ and for us, that’s where we get to be creative and say, ‘That could lend itself into a rain jacket for children,'” says Lindsay. The pair are part of the current cohort at the Joe Fresh Centre for Fashion Innovation at Ryerson University, an incubator aimed at accelerating young companies’ growth. In a funky, older Toronto warehouse space, Natalie Festa shows off a long rack of designer clothing on loan to her business, Boro. At 27, she’s had a corporate job before discovering the niche for her startup: renting out unique clothing to fashionistas who are either eco-friendly or on a budget, or both. “I found myself going to a lot of events professionally as well as personally, and that would lead to purchasing a lot of items that would often sit in my closet after I wore it once or twice,” she says. After borrowing a few outfits from friends, she and partner Chris Cundari had the idea to turn the practice into a business. Clients can rent sequined dresses, Chanel purses and studded leather jackets, among other unique attire, for a fraction of what it would cost to buy outright — typically $80 for four days. Festa recruits lenders as well, who collect half the rental fee, minus the expenses of dry cleaning, delivery and insurance. Some of her clients are social media stars, who are keen to showcase a wide variety of looks but don’t necessarily want to own everything they wear. “It’s quite easy to see that using a service like Boro has a much better environmental footprint than going to the store,” says Festa. Eva Parrell of Toronto worked in the fashion business in Africa, and decided she wanted to create a company that paid workers a living wage and offered well-priced sustainable clothing that would last. The fair trade movement has expanded beyond coffee to include high-end fashion. She and partner Chelsea Mazur launched Peoples Product to attract customers who are aware of the larger consequences of their purchasing decisions. With sales in Los Angeles, Australia, Hong Kong and Canada, the duo are optimistic. Fletcher of the Centre for Sustainable Fashion believes startups like Nudnik, Boro and Peoples Product are signs of the times.